Wolves are members of the family Canidae. The pelt color of Alaska wolves ranges from black to nearly white, with every shade of gray and tan in between. Gray or black wolves are most common, and the relative abundance of each color phase varies over time and from place to place. Most adult male wolves in Interior Alaska weigh from 85 to 115 pounds (38.6–52.3), but they occasionally reach 145 pounds (65.3 kg). Females average 10 to 15 pounds (2–5 kg) lighter than males and rarely weigh more than 110 pounds (50 kg). Wolves reach adult size by about 1 year of age. Wolves are found throughout mainland Alaska, on Unimak Island in the Aleutians, and on all of the major islands in Southeast except Admiralty, Baranof, and Chichagof. This range includes about 85 percent of Alaska's 586,000 square-mile area. Wolves are adaptable and exist in a wide variety of habitats extending from the rain forests of the Southeast Panhandle to the arctic tundra along the Beaufort Sea. Alaska is home to an estimated 7,000 to 11,000 wolves. Wolves have never been threatened or endangered in Alaska. They are found in nearly all of their historic range, excepting the center of urban areas, although they are found on the outskirts of Anchorage, Fairbanks and Juneau. The highest densities occur in Southeast Alaska, where Sitka black-tailed deer serve as the major food source for wolves. 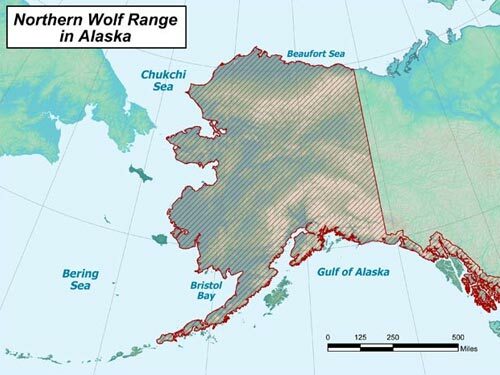 Wolf densities are lowest in the coastal portions of western and northern Alaska. Although the distribution of wolves has remained relatively constant in recent times, their abundance is influenced by harvest levels, diseases, and prey availability. Wolves are social animals that live in packs that may include the parents and pups of the year, yearlings, and other adults. The average pack size is six or seven animals. Packs of 20 to 30 wolves sometimes occur, and these larger packs may have two or three litters of pups from more than one female. Typically one female wolf in a pack has a litter of about seven pups each year. This varies, in some packs more than one female may bring off a litter. In some cases a pair of wolves may not form a pack or belong to a pack, and will bring off a litter of pups. Despite a generally high birth rate, wolves rarely become abundant because mortality is also high. In much of Alaska, predation by other wolves, and hunting and trapping are primary causes of death; and diseases, malnutrition, and accidents to a lesser degree. Predation by other wolves is a major cause of death because wolves defend their territories from other wolves. Dispersing wolves (e.g., young adults) are common but they typically find little suitable habitat that is not already occupied by other wolves. Wolves are carnivores, and in most of mainland Alaska moose and/or caribou are their primary food, with Dall's sheep, squirrels, snowshoe hares, beaver, and occasionally birds and fish as supplements in the diet. In Southeast Alaska, Sitka black-tailed deer, mountain goats, and beaver are the most important sources of food. Research indicates that salmon are important seasonally where they are available, especially to young wolves. During summer, small mammals including voles, lemmings and ground squirrels are taken. Wolves also scavenge. 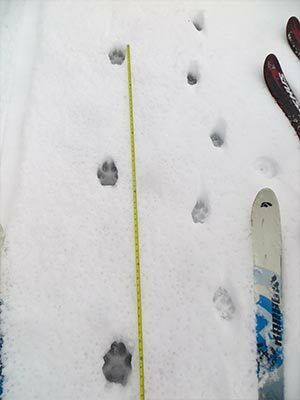 Wolf tracks compared to the human hand. 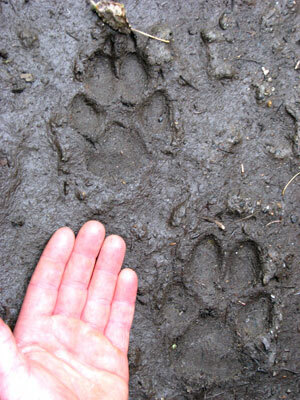 Photograph illustrates the difference between an average wolf track and the track of an 80-pound labrador. Notice how long the stride of the wolf is compared to that of the labrador.